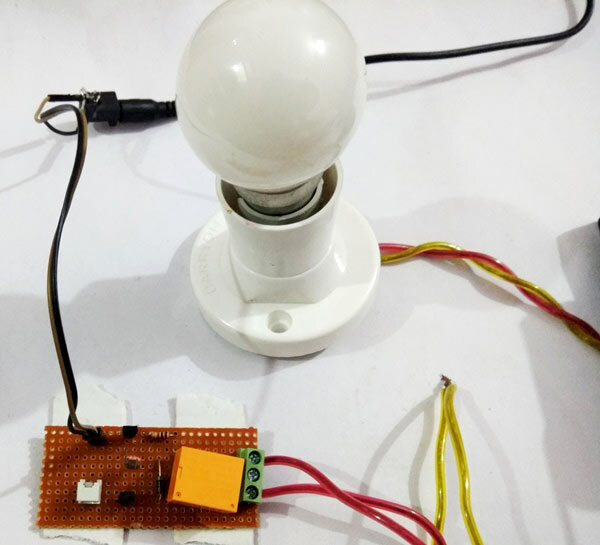 You have seen street light which automatically gets turned on in the night and gets turned off in the morning or day time, there are sensors who senses the light and control the light accordingly. These Street lights are an important project in smart cities. So here in this project, we are going to make a Simple Automatic Street Light Controller Using Relay and LDR. This circuit is very simple circuit and can be built with Transistors and LDR, you don’t need any op-amp or 555 IC to trigger the AC load. Here we have used an AC bulb as street light. Some applications of this circuit are street light controlling, home/office light controlling, day and night indicators, etc. LDRs are made from semiconductor materials to enable them to have their light sensitive properties. There are many types but one material is popular and it is cadmium sulphide (CdS). These LDRs or PHOTO REISTORS works on the principle of “Photo Conductivity”. Now what this principle says is, whenever light falls on the surface of the LDR (in this case) the conductance of the element increases or in other words the resistance of the LDR falls when the light falls on the surface of the LDR. This property of the decrease in resistance for the LDR is achieved because it is a property of semiconductor material used on the surface. In this project, we have used an LDR (Light Dependent Resistor) which is responsible for detecting light and darkness. The resistance of LDR increases in darkness and reduces in presence of light. This circuit is same as a Dark Detector or Light Detector Circuit, only here we have replaced simple LED with a AC load, using a Relay. Two BC547 NPN transistors are used to drive the relay. Whenever light falls over LDR its resistance get decreased and transistor Q1 turns ON and collector of this transistor goes LOW, and this makes the second transistor turns OFF due to getting a LOW signal at its base, so relay also remain turned OFF due to second transistor. 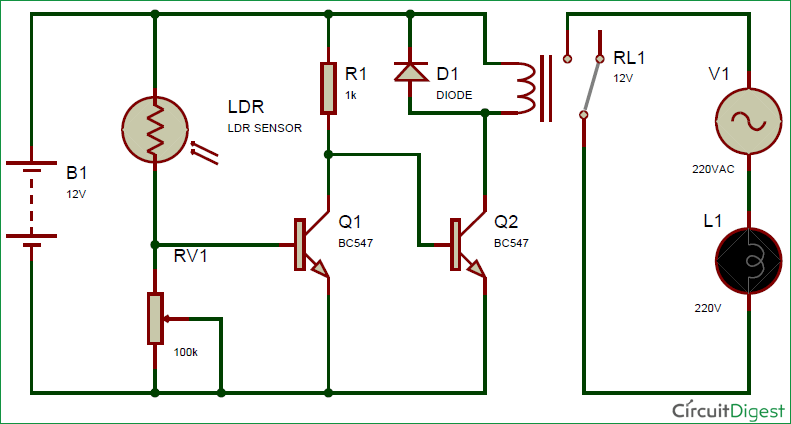 Now whenever LDR senses Darkness, mean no light, then transistor Q1 turned ON due to increase in the resistance of LDR which is responsible for voltage drop at the base of Q1. Due to a LOW signal at the Q1 base, Q2 transistor gets a HIGH signal from the collector of Q1 and turns ON the relay. Relay turned ON the AC load that is connected to relay. A 10K pot is also used for setting up the sensitivity of the circuit. So this is how automatic Street Lights turns on in the night and turn off in the day, check the Demonstration Video below. Sir, can I copy this in my project please?? ineed ur code ....please help me..
Can u pls show me the code? it goes light on while making power on. Can I use their LM358 or comperator.if I can do that then how is it works? Please tell me the details about the relay we use in this circuit.